So a year or so after I built this I decided that I don’t like the lid and a few friends collected about 600 bottle caps and I decided to use them on this revamp. I used Glaze Coat 2 part epoxy on this project and o have to say it’s awesome but you have to be organised when working with it.. You have 15-20 minutes to work with it but as you can see the result can be outstanding. This was my first time dealing with 2 part epoxy but I am please with the experience. I also got to use my new Crafysman biscuit joiner to join all the pieces that the caps sit on.. 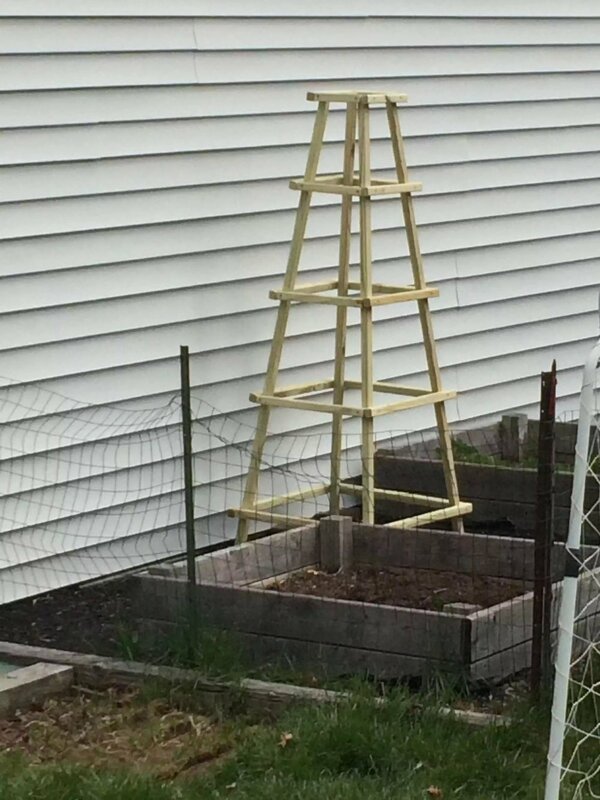 So the honey do list just got a little lighter , my wife asked me to build this obelisk she found one like it on Pinterest.. So I built it with 2×2 pressure treated lumber and the beutiful thing about this project was that there were not angles to contend with and I built it in about 2 hours..
1 box of #8 2” exterior screws.. In case your wondering the wood was actually only 1 1/4” sq . I also made a blog detailing the build so I won’t go into too much detail describing the steps. I used Sketch-Up to design the piece and since I already had a 48 quart cooler in the basement I made the dimensions to suit that. After a very long time the metal mailbox that served us so well is getting retired and it’s time for a fun router project in building a new one…. I know that a softwood like pine is probably not the best wood to use for outside. I put outside stain and about 5 coats of spar varnish and if after all that it falls apart oh well I’ll make it out of oak. I used 1×12 pine board. The box is put together with noting more than a few rabbits and dados to house the sides and base and then I just glued it all together, I really enjoyed this little project as it thought me how to use a chisel and marking gauge and how to efficiently an accurately cut rabbits and dado on the router table. That is until I realized how many nails that I needed to nail into it and I don’t own a nail gun…oh I hope she likes it because I will never do another …that is unless I get a pneumatic nail gun.. The outside frame is made with 2×2 and the chevrons are 1×2…. I made my planter box very similar to this last summer and a relative asked me to make her one so I said sure anyway I owed her big time for minding my kids as I went away for a weekend… I made hers a little different than the one I made myself and the main difference is that my planter box walls I used the wood horizontally and I made her planter walls vertically as you can see.. It came out awesome ….by the way I made a blog on my project here…. Over the last couple of years the yard has been looking very messy, although my vegetable garden did have a fence around it , I didn't like it at all because the mesh that was used was very big. 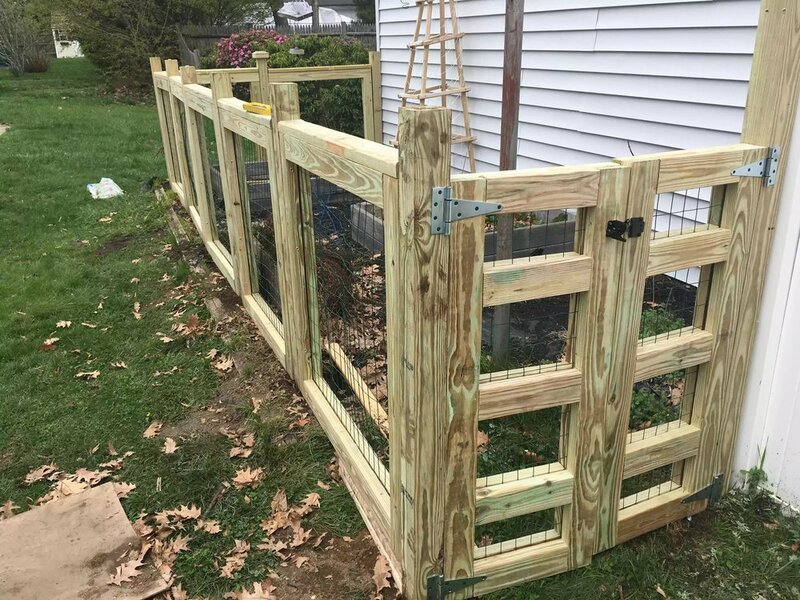 So I decided to design out a nicer looking fence, and it had to be very functional as we needed to keep out all those pesky critters that love to eat out tomatoes and other assortment of vegetables. So I turned to my trusty Sketchup software to design and ultimately price out how much this was going to cost and how much lumber I needed. 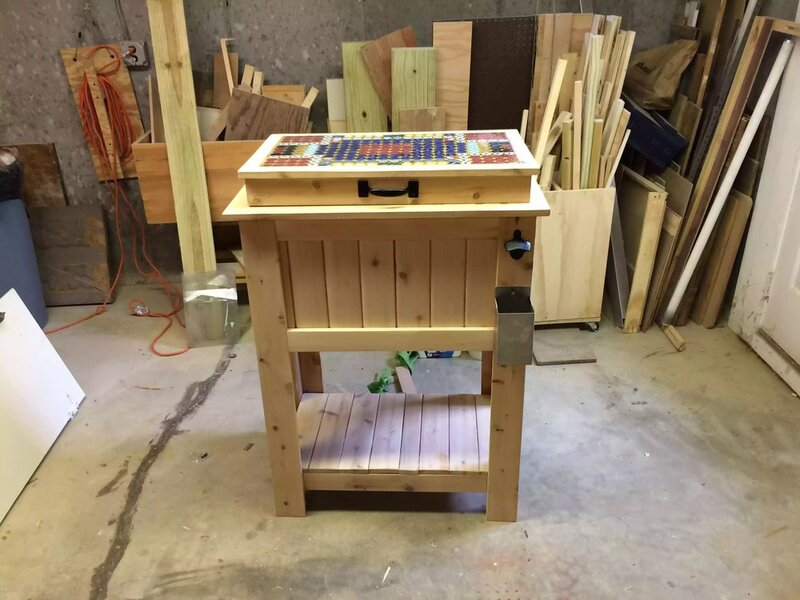 The project was one of the hardest I had ever made and not because of the woodworking involved, but because of the pure size of the project and the weight of the pressure treated panels that I made 1 at a time in the shop and hauled it up from my basement workshop . Took me a 4 day weekend to get this done and I have to say it looks great and really adds a nice touch to the back yard. This project was super fun and didn’t take long to make. I just needed a place to sit while I grill the dinner in the summer and have a beer . Although I know that pocket hole joinery is not considered to be a preferred woodworking joint I used it on this project because of 2 reasons there quick and I didn’t have all that much time to make the bench and the second reason is that it’s easy to keep everything square using this method especially when your working alone. I used the Miles craft router sign system to route the name .. it’s an easy system to use but I don’t like that the bushings and letter templates are plastic and found for some reason the guide judging for some reason burnt right through the bit that they game me… I will have to look at this or perhaps I should just hand carve my next sign. I just bought a new belt sander and it worked a treat extremely powerful for a Ryobi and then I just used my random orbital sander to make the wood as smooth as a baby bum. :- (2) pieces of 12” brass chain. :- 2’x4’ 1/2” thick sanded plywood.. I came across this yard game at a 4th July party and I had that much fun on them I decided to build a pair of them and finish them with paint so as that I could bring them to my friends house. They are 4×2 so they are kind of big to lug around you can make them smaller if need be. I didn’t realize that they were so expensive to purchase and to build them was a lot cheaper. I made this set in 2014 and they have been that popular I have made about 4 of them for friends and family, last year a made a set of Patriotic colored boards and he loved them. 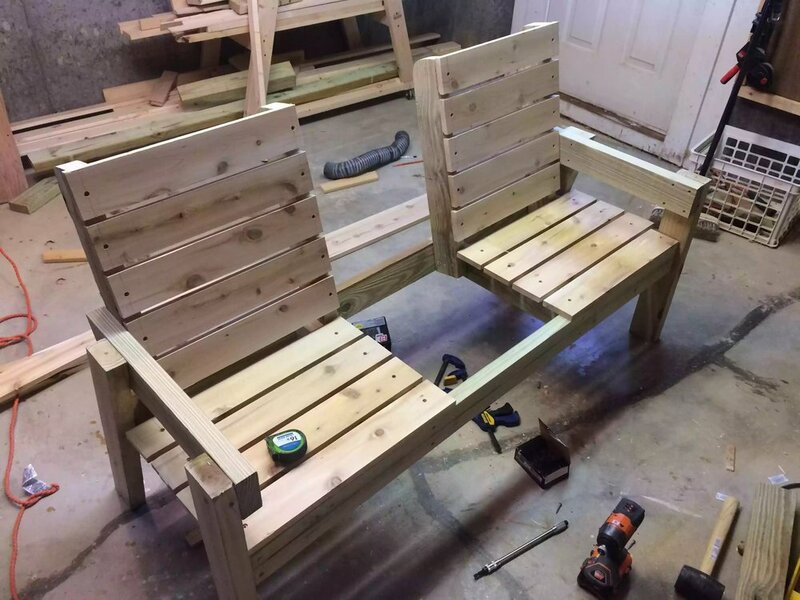 These sets can sell for anywhere around $300.00 + I made them for around $75. 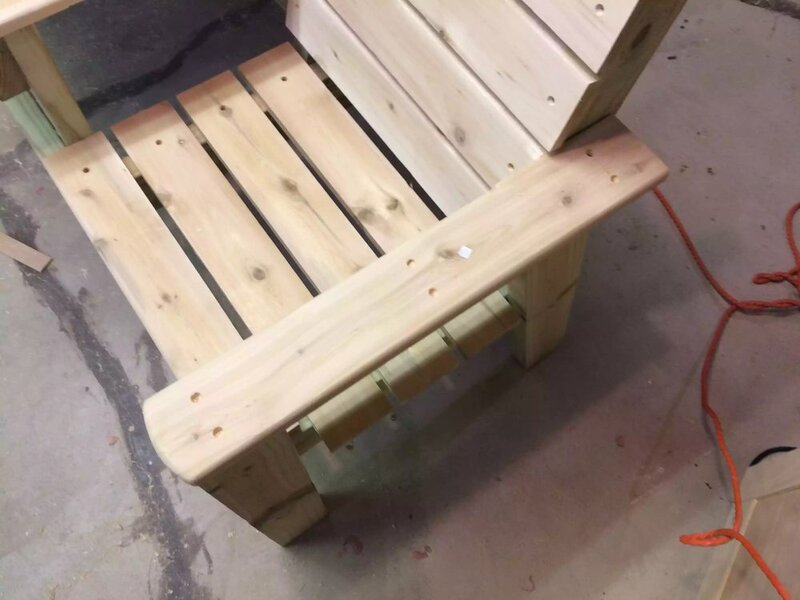 This was one of my first projects as a woodworker and its extremely easy to make, in fact I showed a couple of kids how to make them one day. This is one of my staple games that I bring to any summer party and it awesome and enjoyed by both adult and children. When we first started playing it we used bags so as that we were not firing around metal washers especially where all the children were going crazy, but soon enough we got used to using the bags we never even tried to use washers. 6" diameter pipe (only need like 8"). So I am not sure why I'm building this bird feeder in the middle of winter but I had some cedar lying around and I was looking at some of my project books and I saw a design in this Birdhouse Book and decided to build it…. I hope you like it. 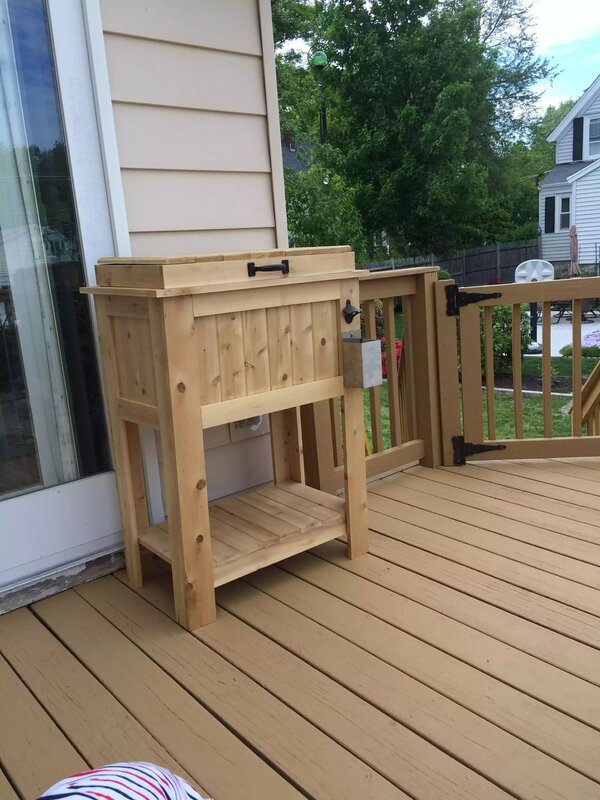 I picked this feeder because I liked its simple look and I have to admit the piano hinge on the roof will work awesome….. It wasn’t too hard to make but the piece of cedar that I had was very dry and it cupped in the middle but I had just enough wood to finish the project. If you are looking for a book that has detailed plans and a lot of information on how to construct some any bird house and feeders check the link that I attached…. 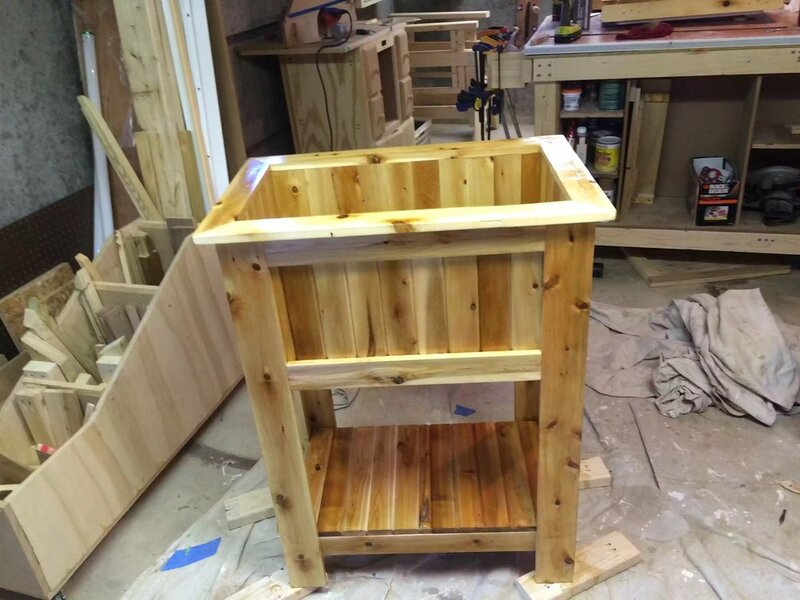 I made this this feeder in 2015 and its still going strong, also this was one of the first times I used cedar and its one of my favorite woods for outside projects and I love the smell of the lumber.